In Yasujiro Ozu’s Good Morning, well-placed farts stand in for the limits of language. In 1953, two years after my mother was born in Japan, Yasujiro Ozu’s Tokyo Story was released. I remember watching it sometime in the early 2000s, alone, just after my grandmother’s death and thirty years after the film’s eventual American premiere. (It was long assumed to have been “too Japanese” for foreign audiences.) Watching it again a few weeks ago, I realized that on the first go I had absorbed almost none of the plot. Only on second viewing did I remember anything—and then only because I recognized the speech patterns of a certain character, a grandfather who comes with his wife to visit his children. His verbal tics brought not just the plot but the film’s patient and peculiar beauty back to me in a rush. Tokyo Story is laden with nonspeech; it punctuates the conversation of the grandparents, rendering their observations and questions melancholic, tentative. The grandfather in particular indulges in almost incessant hmms and sighs, each seeming to remark, worryingly, on the fragility and formality of the space in which parents and their adult children must meet. How exactly do our lives emerge from the lives of the people who made us and from the lives of the people who made them? And when do we break from them? And what if new ways of life—new cultures and socioeconomic organization and forms of modernity—intercede, as they always do? I’ve never learned Japanese, nor has my mother. The expectation that she would, today, visit me in my home for more than an hour strikes me as faintly ridiculous. When she was alive, my grandmother never saw the inside of one of my apartments—perhaps a good thing, given the company I kept. 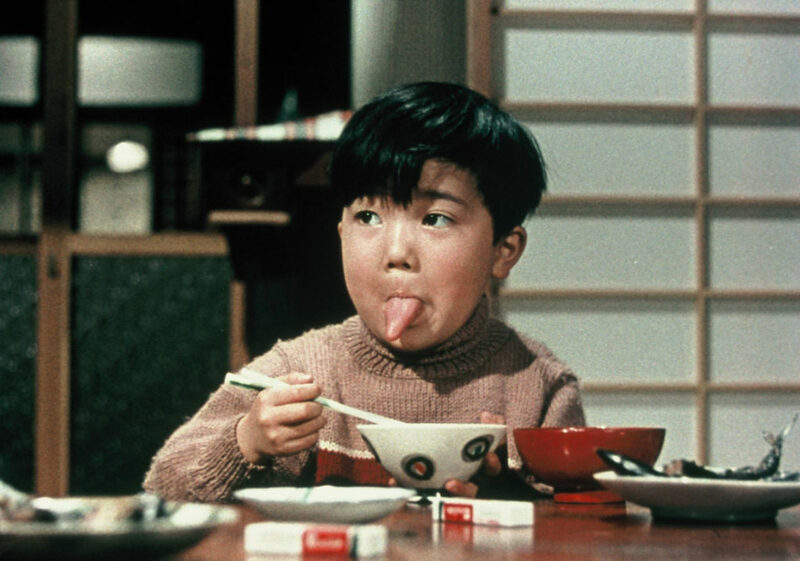 Home, the scissions of family life, the way these small and inevitable shifts cast light on generational and cultural change: these are Ozu’s central themes. And more than these: in Ozu’s works, from the early black-and-whites to the later, vivid postwar films that followed on the heels of the American occupation, you can feel his attention to linear and cyclical time as well as to the grander spans, the measures of all life, the seasons and the hours of the day. Late Spring (1949), Early Summer (1951), Late Autumn (1960), An Autumn Afternoon (1962). Ozu’s films are a sort of chambered universe, zones of growth and change through which the viewer may pass from one to the other. Like Tokyo Story, the film exposes us to the smallest units of speech—to the thin membrane between communication and noise. Good Morning is inarguably the least loved and least representative in the Ozu canon as it’s conventionally understood. But as is often true of comedy in more or less anybody’s oeuvre—whether or not they’re known as comic artists—Good Morning is a sort of first principle; in a certain sense it is purer than Ozu’s seemingly more serious works.. It is perhaps a more intricately structured investigation of what we can say through the walls of time and age and experience erected even between parents and children, siblings, lovers. It is a chamber piece for all the human linguistic instruments: fart and sigh, small talk and drunken ramble, all the possible declarations of weakness, suspicion, compromise, and love of which you could conceive. Rather than unloved or strange within Ozu’s oeuvre, Good Morning might be exactly where the new viewer of Ozu ought to begin. It struck me as where I ought to have begun if I had wanted to understand better something of the culture my grandmother left behind. The screenplay—by Ozu and Kodo Noga, one of his frequent collaborators—splits into a fluid but intricate three-strand braid. 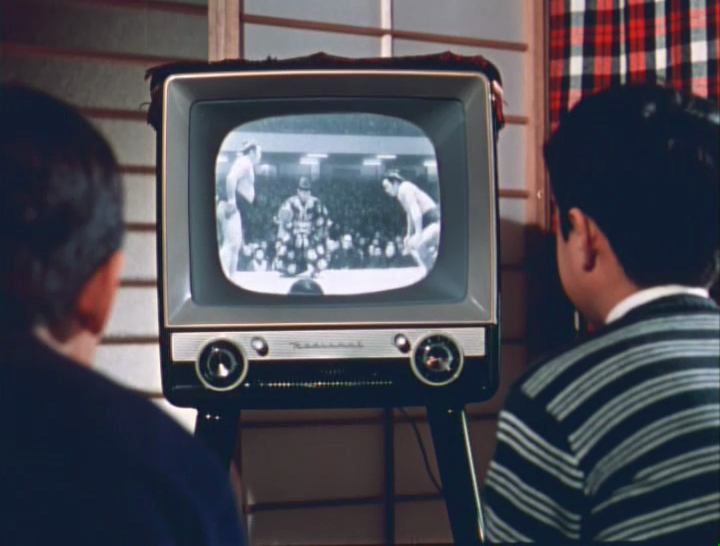 Two brothers, Isamu (Masahiko Shimazu) and Minoru (Sitara Koji), around the ages of six and twelve, wage a war of silence to try to force their parents to buy them a television set so they can watch sumo. An English tutor (Keiji Sada) and a young businesswoman, Setsuko (Yoshiko Kuga), try to find the language to express, delicately, their love for one another, and, in turn, to decode the small talk they’ve exchanged as shy declarations of love. At the same time, a clutch of suburban mothers, including Isamu and Minoru’s mother, works through a series of internal accusations about a petty left of funds meant to have been delivered to the local women’s association. The wives are orbited by a set of ineffectual husbands and by a comic grandmother (Eiko Miyoshi) who complains aloud, during her prayers, that her daughter is an ingrate. The grandmother represents one extreme end of the film’s exquisitely broad spectrum of forms of speech: she says exactly what she means. In turn, the noisy camaraderie between the boys—who talk to each other even during their silent strike—mirrors the gossipy, too-adult, and decidedly duplicitous language of their parents. Every morning, on their way to school, Isamu, Minoru, and a few others play a language game in which they push each other’s foreheads to make each another fart. (They’re also constantly eating pumice stone because they think this might make their farts louder.) Their earnest attempts at understanding and exploiting the arbitrary laws of adult life become the counterpoint to the petty intrigue and false moralism of the housewives. “Listen,” says one of the women, stepping inside her neighbor’s house, smiling thinly—“I’ve just heard something odd.” And that’s a good joke. This is, after all, the fart movie. Good Morning sings with an insistent, subtle intelligence. It asks after the origin and purpose of language and suggests that the degree zero of speech is laughter, which is where the farts come in. (Film scholars sometimes write that the farts “degrade” communication in the film, which strikes me as bunk.) When the boys begin their silent protest, their English teacher communicates with them by pressing their foreheads to make them fart; they can speak to him in this way, just as he can ask Setsuko how she feels about him by asking her how she feels about the weather. The little Isamu’s devil-may-care interjections of the English phrase “I love you” offer a gentle prolepsis of the changes wrought on the youngest generation by World War II and the arrival of American forces. These were my mother’s cousins, whom she has never met; for me, watching Ozu’s characters, his families, involves the strangeness of knowing that you are a version of them, on the other side of the world. There are things in Good Morning that speak very subtly: you have to notice who’s wearing Western clothing, and ask yourself why. You have to know to notice that the arrival of a television or an electric washer in a world without central heating—a world in which the center of every home is still a charcoal-burning hibachi—is something extraordinary. The yellow of the French’s mustard on restaurant tables picks out the creamier colors of a kimono. In its shapes, its many geometries, and its interleaving of West and East, Good Morning reminds me of my grandmother’s house in California, of the quilts she used to make, of the sunburst clock over the mantle, and of the sound of her laughter when I brought home a Japanese friend one Thanksgiving. How loudly they talked. How badly it hurt that I couldn’t understand any of it, except for their facial expressions. And their laughter. I had never seen my grandmother laugh like that. Ozu forced his first mentor to read the Good Morning screenplay during a disciplinary meeting—he’d punched someone who cut in line at the studio canteen. This rowdiness is one important source of his art, not the stereotypical tranquility American audiences tend to find in Japanese art but what would become as he matured a justified, patient, and almost imperceptible ebullience. The film contains the optimism that underwrote the most agonizing of his later works. His art consisted in the lightsome management of what would otherwise be unbearable social change—change that, if left unchecked, would wall the generations off from one another. Good Morning is a testament to the means by which we can communicate. One of the little boys in the town can’t make himself fart on command, no matter how hard he tries or how often he gets the others to press his forehead. He often tries so hard he shits his pants and has to abandon the walk to school and creep home, where his mother provides him with clean clothes, accompanied by a certain amount of bitching. (She doesn’t have a washing machine, not yet.) 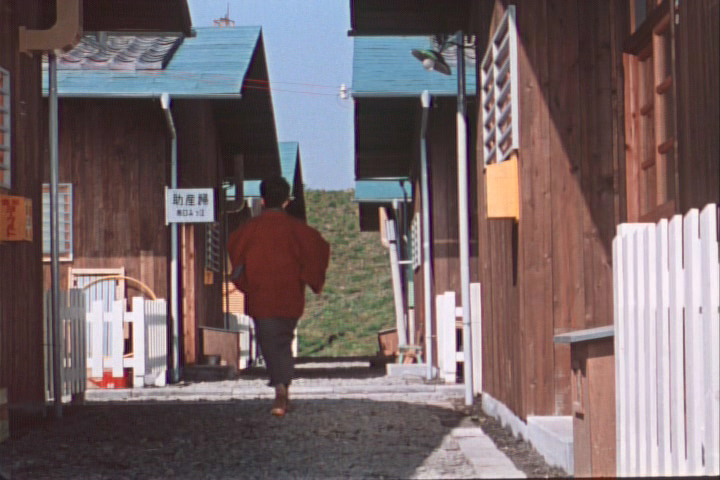 The final shot of Good Morning is rapturous and subtle, a prelude to several similar shots in Ozu’s later masterpieces. Several pairs of handwashed underpants flap brightly in the wind: a miraculous reminder that sometimes love requires no words, no sound at all. Annie Julia Wyman writes fiction, criticism, and TV. She earned her Ph.D. in comedy at Harvard and is a member of the Language and Thinking faculty at Bard.